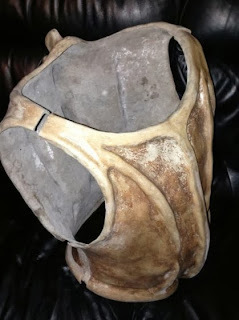 Making My 5th Doctor Costume: Silurian body parts on eBay - UPDATE! Silurian body parts on eBay - UPDATE! 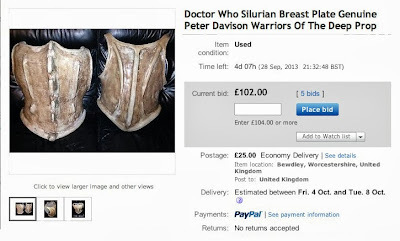 The silurian body parts keep coming on eBay! After the sale of the Right Arm and Chest, Left Arm and Back, Right Leg, as well as Framed Body Parts - we now get the breast plate! 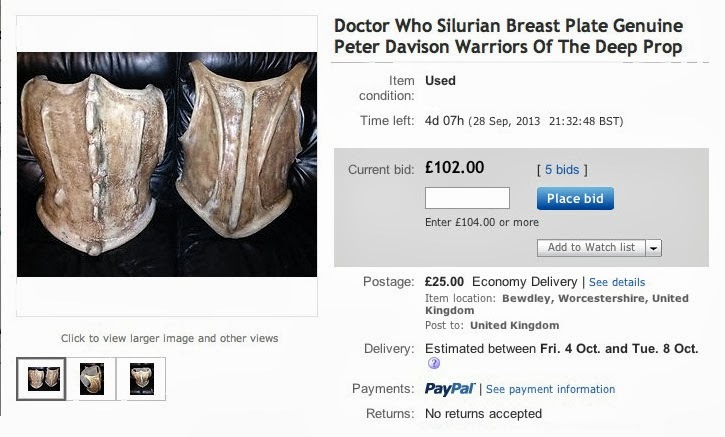 This is a Silurian breast plate and back plate from the 1984 Peter Davison story Warriors of the Deep. 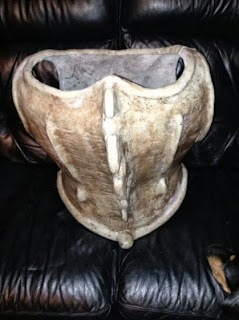 This has come directly from my private collection of props and costumes. I was given this by someone who worked for the company who made many of the props, costumes and monsters including the Cybermen in the 1980's. 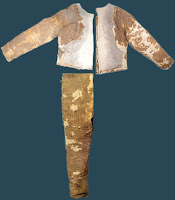 Once filming had finished things like this were either scraped or sent to the exhibitions. This one survived both of those fates and I was given it some years later as part payment for some work I carried out. 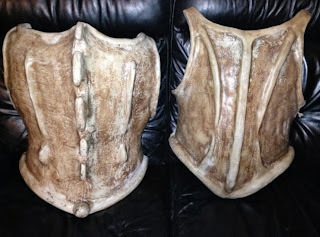 This basically consists of two glass fibre halves that bolt together to form the armour on the body of the Silurians. It looks like it would have been held together by 4 fixings, possibly small bolts which are missing. It is exceptionally well made with a painted finish to match the rest of the suit. Obviously being nearly 30 years old it has knocks and scrapes but is in remarkably good condition for its age. 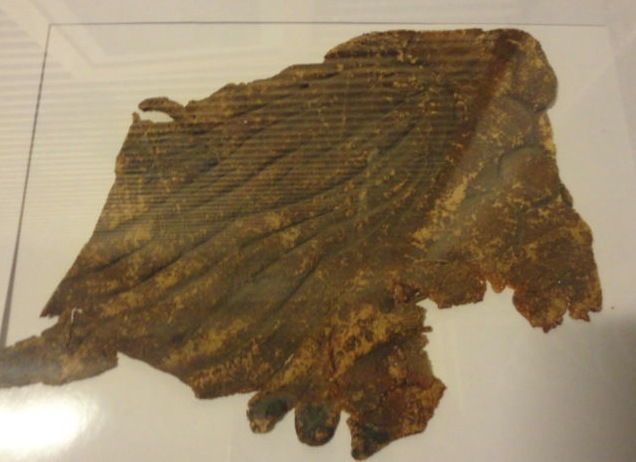 There are various chips, cracks and other marks on the armour as can be seen in the pictures. The reason I'm selling this (and other pieces from my collection) is that I have several original pieces that I prefer and as I'm thinning out my collection this is one of the items I'm letting go. 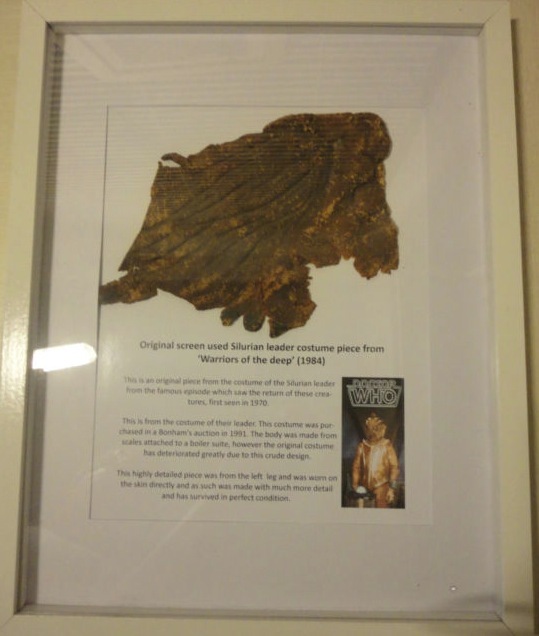 I will (if required) give a written COA confirming what I know about this piece of classic Who history. This is an amazing piece - with the anniversary of doctor who, I thought I would offer this last amazing opportunity. 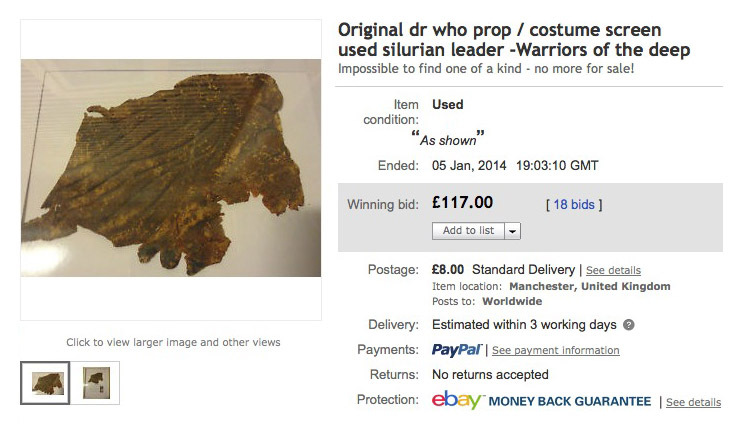 This is the last remaining piece of the original screen used costume for the Silurian Leader Ichtar from this famous Peter Davison story that I have - I did not intend to sell this, as it is my own I was going to keep, but pressures have forced my hand! The suite was purchased by me on from the BBC dr who 1991 Bonhams auction. It had deteriorated awfully - you may have seen the main boiler suite element of the costume on ebay a few weeks ago - essentially, that was just a dirty white suite with a few scales as they had all fallen off. However, the legs and arms were actual proper fitted costume pieces with full latex fitted appliances and the left leg piece is what we have here. It is beatiful - you can see the scales, the texture, the colour in this amazing large original piece. This comes displayed in a large custom made display frame and will be supplied with certifcate of provenence confirming its authenticity and purchase from an official BBC auction at Bonhams.